Dr. Martin Luther King and Muhammad Ali shared a bond in their commitment against war and for social justice. It wasn’t a popular bond and it deserves to be remembered. Muhammad Ali and Dr. Martin Luther King Jr. have been dominating my thoughts recently, and not only because their birthdays just passed, a mere two days apart. Ali was admitted to the hospital on Thursday for being in a “non-responsive state”. This was happening as news that Selma, the film about Dr. King’s 1965 civil rights campaign was being both snubbed at the Oscars and hammmered by President Lyndon Johnson’s old apparatchiks, aghast that the film did not give LBJ what they believed was his proper due as a civil-rights hero. The national fear that these could have been Ali’s last days, as well as the concern that LBJ wasn’t getting enough of Dr. King’s reflected glory, could cause your brain to short-circuit if you were familiar with the actuality of their history, not to mention their private friendship during the 1960s. And yet, as the 1960s moved forward, Muhammad Ali and Dr. Martin Luther King formed a common bond forged through the common hatred showered upon them and their loved ones. As John Carlos, famed 1968 Olympian and protester, once said to me, “If there was an Olympic sport for number of death threats received back then, King and Ali would be fighting for the gold.” I have seen some of these death threats, and they are terrifying in a way that Twitter threats, awful as they are, simply are not. They are written often with a rational hand and comprise thousands of words, with knowledge of their targets’ movements, and solemn promises of when their lives or the lives of their children would end. As the 1960s propelled forward, both men were part of a common black freedom struggle that was blurring the lines between “nationalism” vs. “integrationism” taking on not only the legal barriers to integration set forth by Jim Crow but the intractable racism of the North. We know of their friendship only because of those invaluable stenographers at the FBI. Here is one FBI wiretap summary with Martin Luther King Jr. in which Muhammad Ali is referred to derisively as “C”, for Cassius Clay. Ali and Dr. King saw their connection become unbreakable in 1967 when King made the courageous decision, against the wishes of his advisers, to take a stand against President Johnson’s escalation of the war in Vietnam. By this time, Ali had already become the most visible draft resister in the country, standing strong despite the stripping of his heavyweight title and the threat of a five-year prison sentence in Leavenworth. The two men also appeared together at a fair-housing rally in Ali’s hometown of Louisville, Kentucky. There, Ali said, “In your struggle for freedom, justice and equality, I am with you. I came to Louisville because I could not remain silent while my own people, many I grew up with, many I went too school with, many my blood relatives, were being beaten, stomped and kicked in the streets simply because they want freedom, and justice and equality in housing.” Ali was now a protester. Dr. King was now an internationalist. The boxer and the preacher had come together as one. It took a bullet on April 4, 1968, to end this fellowship between Muhammad Ali and Martin Luther King Jr. For both men, it required losing the power of speech, whether in death or as a result of Parkinson’s disease, to be embraced by the country as a whole. At a time when a new movement is finding its feet to stand against police violence and stand for the deceptively simple request for people to see that #BlackLivesMatter, we would do well to remember the hatred endured by both these men in the name of delivering truth. 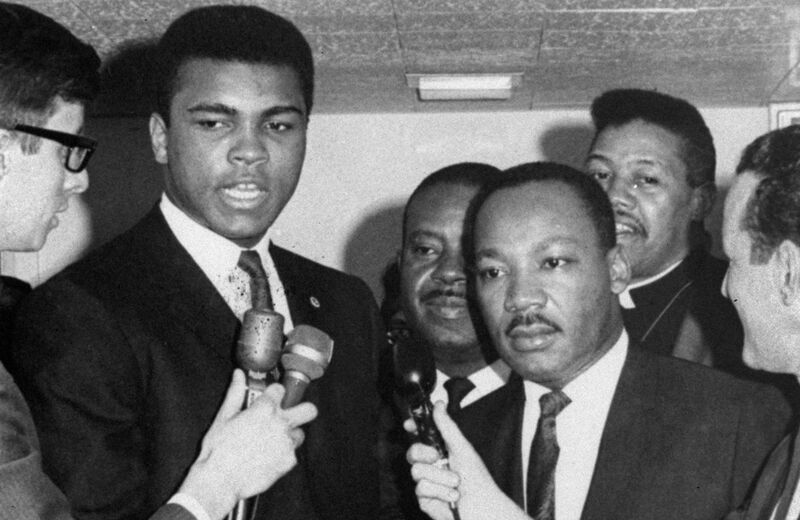 At a time when this movement is attempting to forge connections with oppressed people across the globe, from Ferguson to Gaza, and trying to figure out how to deal with a frustrating president in the Oval Office as well as a class of civil-rights leaders reluctant to give up the microphone, it is worth remembering how much hate King and Ali proudly invited upon themselves. Their only moral compass was one that pointed toward standing with the powerless against the powerful. That was the basis of their friendship. That should be basis of our own solidarity as we move forward today.